This table visualizes both the storage method and picking method, and their effects on order picking speed. Velocity is the lines per hour picked. SKU frequency is the number of times a particular SKU is picked, from A (most), to D (rarely). SKU frequency is detailed below. How do the various picking technologies fare? Dispensers: For extremely high velocity picks, usually in excess of 1,100 lines per picker per hour. Dispensers (a-frames and others) are highly-automated technologies that make sense if the product type and volume are right. Light-directed picking: Typically used in conjunction with dynamic storage such as carton flow. This type of system covers a broad range of SKUs in terms of lines-per-hour, ranging from 300 all the way up to nearly 1,200. The versatility is key here, since pick-to-light works with a variety of storage and picking media. It’s considered faster and more accurate than other types of picker notification. Case pick label: Excellent for fast-moving case picks, ranging from 200 to 700 lines per hour in dynamic storage. Voice picking: Voice picking technologies typically deliver 100 to 300 lines per hour velocity. Can be used on static or dynamic storage. RF Picking: Typically good for a range of lower volume picks, but reduces reliance on printed pick tickets. Paper tickets: Paper tickets are manual and tend to be the slowest method. They rely on the literacy and detail skills of an order picker. These ratings are based on the picking volume for a particular SKU. “A” Movers: These are the fastest-moving SKUs in your operation. They tend to be less than 20% of your stock items, but represent 80% of picks in a pareto analysis. They may have 2,000 to 2,500 picking locations in a typical ecommerce or retail distribution operation. These SKUs are typically stored in flow storage for easier access and presentation to pickers. These are such fast movers that you may have mirrored pick lines and locations for them. “B” Movers: These are your secondary SKUs. They have solid volume and can present some storage and picking challenges. They are stored in flow storage most of the time, but could also be slotted into static or carousels if the situation warranted. “C” Movers: These may be specialty or seasonal items. Sometimes they are kept for a subset of customers or specialty volume. In any case, they represent slower pick volumes. Typically stored in shelving or racking, but could be kept in carousels in some instances. “D” Movers: Affectionately called the “dogs” of an order fulfillment operation, these SKUs are infrequently accessed. They may represent discontinued items, excess inventory, or just extremely rare. Companies keep these for a variety of reasons. They are usually in static storage like racks or shelving, but may also make sense in carousels or ASRS. These numbers are broken down into hundreds, so round as applicable to your operation. Typically if an item is being picked more than 200 times per hour, it should be in dynamic storage. 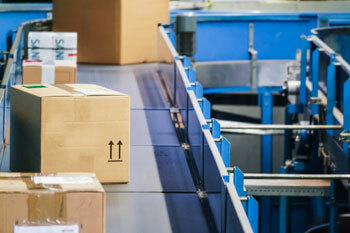 Carton flow: This solution covers a broad variety of picking applications. It plays well with identification methods ranging from pick-to-light to manual tickets to voice directed options. It works for SKU movers ranging from just a few SKUs to really high volume-volume picks. 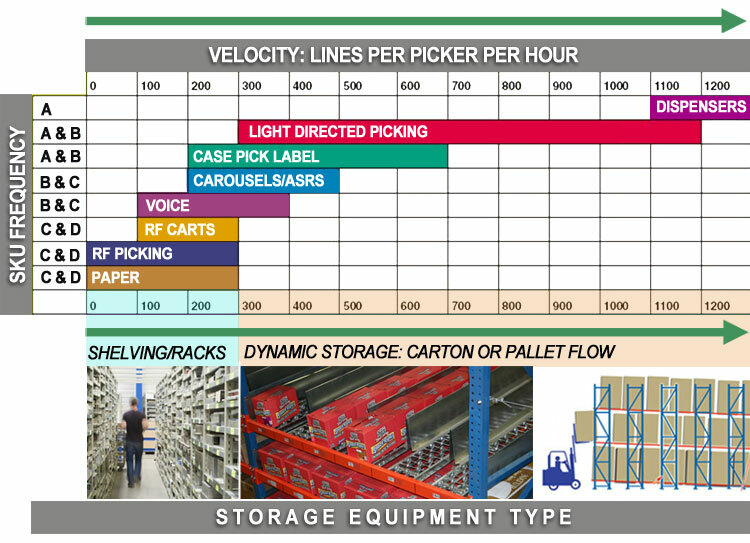 Goods to picker media: Carousels & ASRS: These storage options shine in operations where you want to limit picker mobility. They also tend to enhance inventory security and storage density. Count on 200 to 500 each-picks per hour for your primary and secondary movers. They can be used with a variety of pick ticket options and situations. Static storage: Using racks, shelving and other static storage is ideal for your SKUs that command fewer than 300 picks per hour. In some cases, due to the versatility of storage slotting, these “old school” storage methods for order picking are ideal for many products that may not fit into automated systems or dynamic storage. They are good for reserve storage of course, but can be the primary picking location for a number of relatively fast movers, depending on load type and other factors. Of course, the type of picks can cause variation in these numbers. Each pick will differ from case or pallet picks. Seasonal factors or market spikes may transform a slow mover into an “A” mover. These numbers tend to be general, but are a good “rule of thumb” for ecommerce and omnichannel fulfillment operations.